A scan of my first-ever photojournalism and written article story. 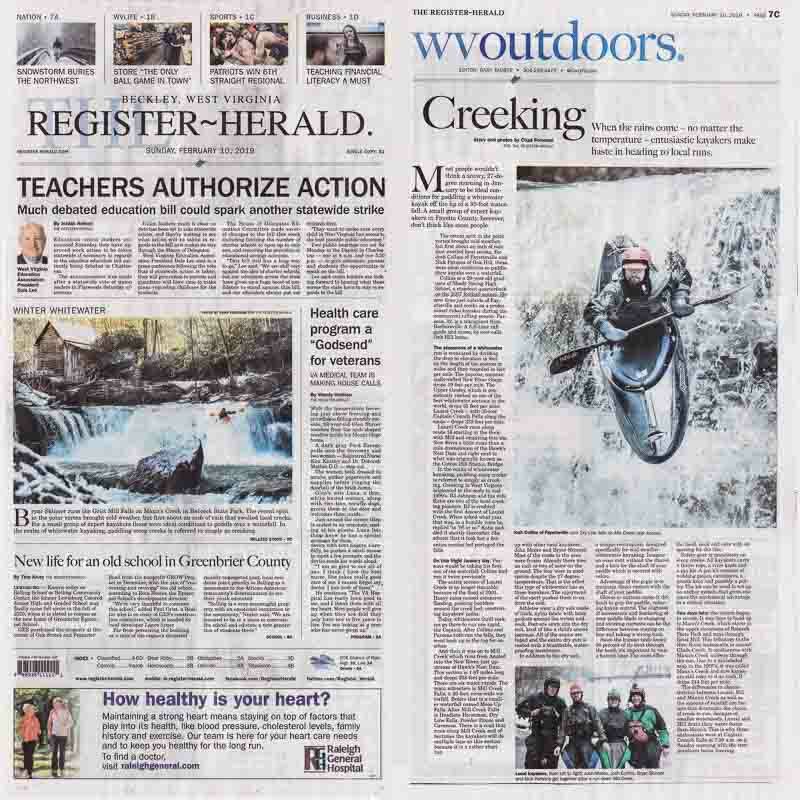 The following article is what I wrote to accompany the pictures I shot of a group of local kayakers. I submitted it to the Beckley Register-Herald and they published it on February 10, 2019. 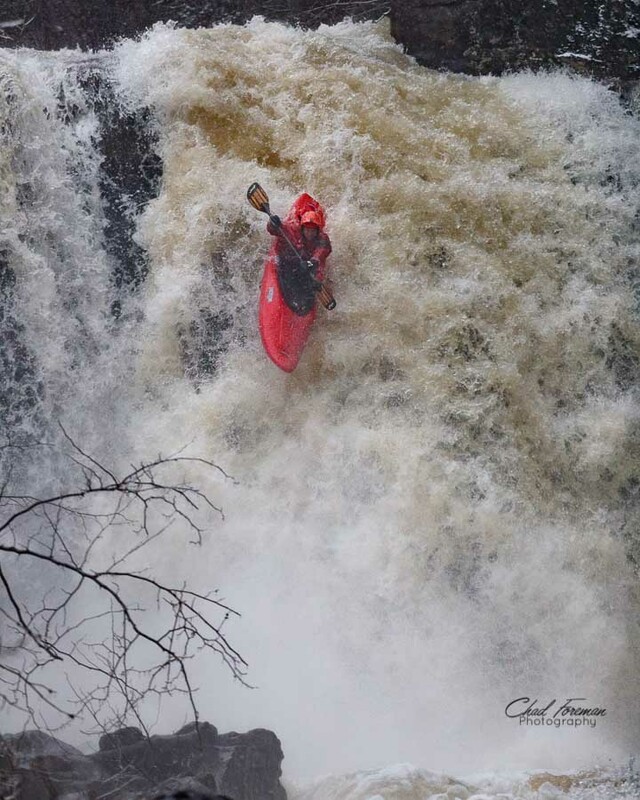 Most people wouldn’t think a snowy, 27-degree morning in January to be ideal conditions for paddling a whitewater kayak off the lip of a 35-foot waterfall. Most people wouldn’t think any conditions could be ideal for something like that. However, a small group of expert kayakers in Fayette County don’t think like most people. The recent split in the polar vortex brought heavy rain storms and frigid temperatures to Southern West Virginia. On Saturday, January 19th, the National Weather Service reported .88” rainfall. For Josh Collins of Fayetteville and Nick Parsons of Oak Hill, these are ideal conditions to paddle their kayaks over a waterfall. Josh Collins is a 29-year-old graduate of Shady Spring High School. Tiger fans may remember him as a standout quarterback from the 2007 football season. He now lives just outside of Fayetteville and works as a professional video kayaker during the commercial rafting season. Nick Parsons is 32-years-old and originally from Barbersville, WV. He currently resides in Oak Hill. Nick is a full-time raft guide and nurse. Nick Parsons Drops Captain Crunch Falls. At thirty-five-feet tall, Captain Crunch Falls is one of the highest waterfalls in the region and is part of Laurel Creek. This was Parsons’s first attempt at running the waterfall. Collins had run it two times before. Laurel Creek is one of the steepest creeks in the area. The steepness of a whitewater section is measured by dividing the drop in elevation in feet by the length of the section in miles and then recorded in feet per mile. The extremely popular, commercially-rafted New River Gorge drops 19 feet per mile. The Upper Gauley, which is consistently ranked as one of the best whitewater sections in the world, drops 35 feet per mile. Laurel Creek drops a staggering 339 feet per mile. Laurel Creek runs along route 16 starting at the Beckwith Mill and empties into the New River, 1.2 miles downstream of the Hawk’s Nest Dam and right next to what was originally known as the Cotton Hill Station Bridge. In 1999 the bridge was renamed to honor Major General Charles Calvin Rogers. MG Rogers was from Claremont, a small town in Fayette County which sat along the New River, just upstream from Stonecliff. He was awarded the Congressional Medal of Honor for bravery in Vietnam. In the realm of whitewater kayaking, paddling steep creeks is referred to simply as creeking. Creeking in West Virginia originated in the early to mid 1990’s. BJ Johnson and his wife Katie are two of the local creeking pioneers. BJ is credited with the first descent of Laurel Creek. When asked what year that was, in a humble voice he replied “in ’95 or so.” Katie paddled it shortly thereafter. She admits that it took her a few runs to work up the courage to run Captain Crunch Falls. Up until that point she ran the entire section but portaged the falls, or got out of her boat and walked around it. BJ is originally from Fayetteville and graduated from Fayetteville High School in 1991. Katie is originally from Iowa but came to West Virginia after the allure of the famous Gauley River brought her to the area for the 1993 Gauley Season. They still live in the area and their children attended Midland Trail High School. 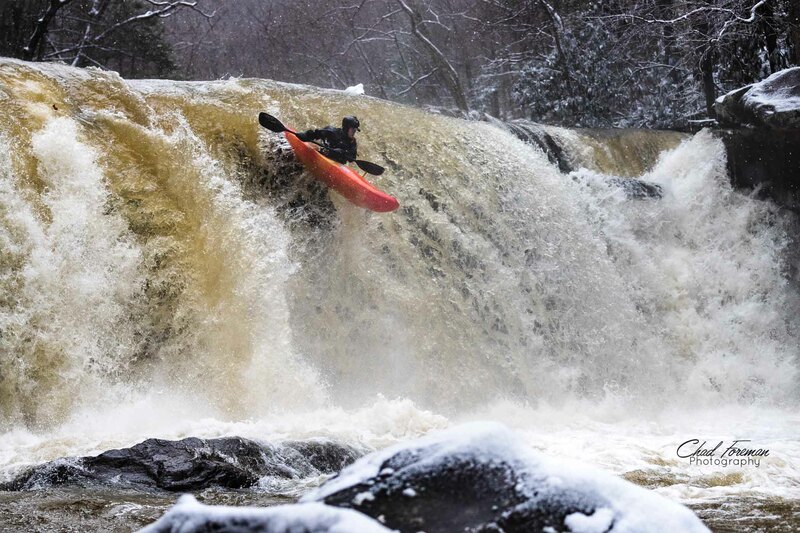 John Moore of Fayetteville, West Virginia paddles through the snow and ice and over the lip of Mill Creek falls near Ansted, West Virginia. The entire section of Laurel Creek is no longer runnable because of the flood of 2001. Heavy rains that caused extensive flooding pushed boulders around the creek bed, constricting the kayakers’ paths. Today, whitewater thrill seekers go there to run one rapid, the Captain. After Collins and Parsons both ran the falls, they got out of their boats, picked them up, and went back up to the top for another run. Each boater ran the falls twice. As if that wasn’t enough to satisfy their whitewater cravings, it was on now to Mill Creek. Mill Creek runs from Ansted into the New River, just upstream of Hawk’s Nest Dam. This section is 1.87 miles long and drops 208 feet per mile. There are six major rapids. The main attraction is Mill Creek Falls, a 20-feet tall, river-wide waterfall. Before that is a smaller waterfall named Mess-Up Falls. After Mill Creek Falls is Headless Horseman, Dry Line Falls, Powder House and Caveman. There is a road that runs along Mill Creek and oftentimes the kayakers will do multiple laps on this section because it is a rather short run. 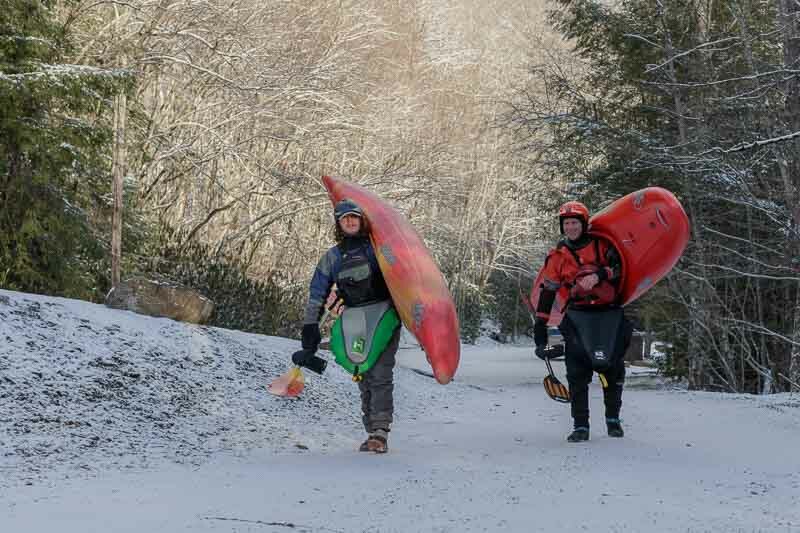 Collins and Parsons arrived at the snow-covered put-in to meet up with other local kayakers, John Moore and Bryar Skinner. Most of the roads in the area were frozen. Already there was an inch or two of snow on the ground. The fearless foursome was in good spirits despite the 27 degree temperature. 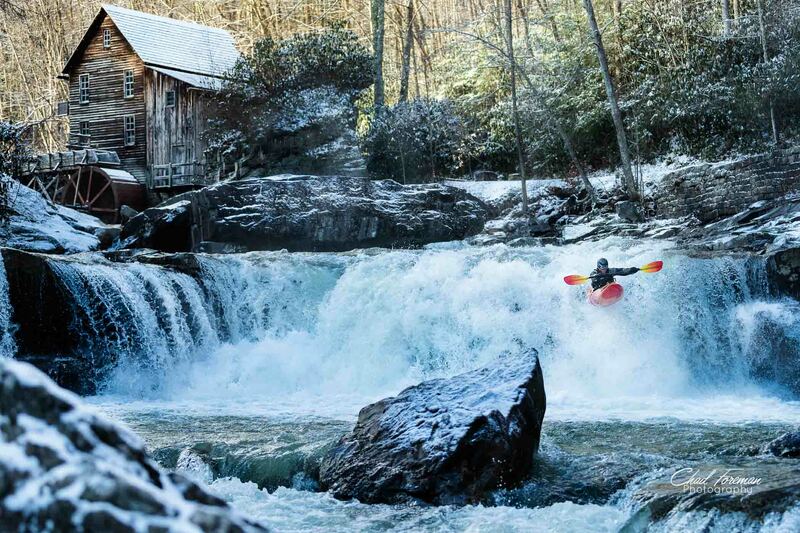 That is the effect this type of whitewater has on these kayakers. The enjoyment of the sport pushes them to endure the cold weather. Whitewater kayaking gear has come a long way in recent years. Technical fabrics have advanced leaps and bounds in the past decade. Athletes wear a dry suit. A dry suit is made of thick, nylon fabric with latex gaskets around the wrists and neck. Feet are sewn into the dry suit, kind of like a child’s onesie pajamas. All of the seams are taped and the entire dry suit is coated with a breathable, waterproofing membrane. Entry and exit from the dry suit is through a zipper in the upper back. In addition to the dry suit, kayakers use pogies to keep their hands warm. 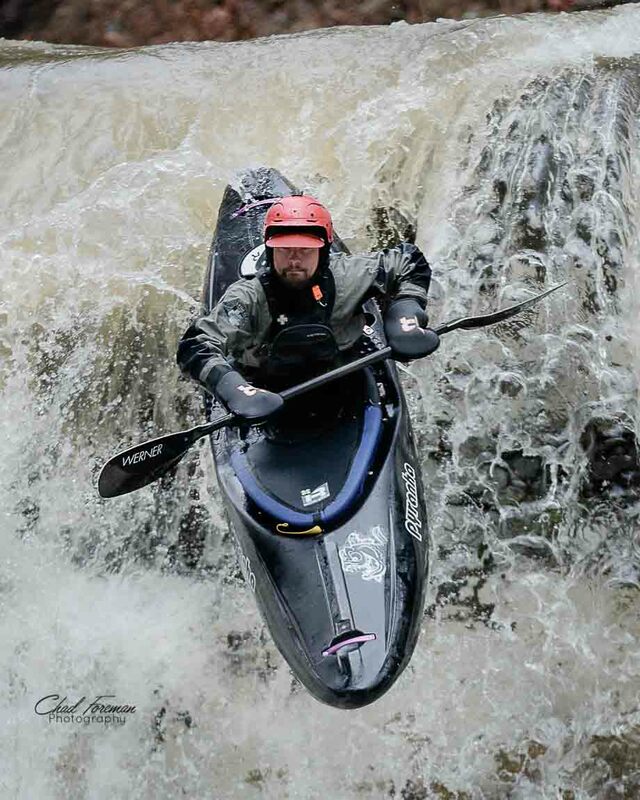 Pogies are a unique contraption, designed specifically for cold weather whitewater kayaking. Imagine an oven mitt without the thumb and a hole for the shaft of your paddle which is secured with velcro. Advantage of the pogie is to maintain direct contact with the shaft of your paddle. Gloves or mittens make it difficult to grip the paddle, reducing kayak control. The slightest of movements and feathering of your paddle blade in changing and swirling currents can be the difference between staying on line and taking a wrong turn. Since the human body looses 90% of its heat through the head, it’s important to wear a helmet liner. The most effective winter weather helmet liner is the balaclava. The balaclava covers the head, neck and ears with an opening for the face. Safety gear is mandatory on steep creeks. All kayakers carry a throw rope, a river knife and a pin kit. A pin kit consists of webbing pieces, carabiners, a prusik knot and possibly a pulley. The kit can be used to set up an anchor system that gives rescuers the mechanical advantage in a critical situation. Bryar Skinner (left) and Nick Parsons make their way across a snow-covered ground on their way to the put-in for Mann’s Creek in Babcock State Park near Fayetteville, West Virginia. Two days later the waters began to recede. It was time to head up to Mann’s Creek. Mann’s Creek starts in the upper elevations of Babcock State Park and runs through the beloved Grist Mill. If this tributary to the New River sounds familiar to you but you know its name to be Glade Creek, you would be correct. Technically, this creek is named Glade Creek. It confluences with Mann’s Creek midway through the run. Due to a mislabeled map in the 1990’s, it was called Mann’s Creek and now kayakers still refer to it as Mann’s Creek. It drops 244 feet per mile. The differences in characteristics between Laurel, Mill and Mann’s Creek as well as the amount of rainfall are factors that determine the choice of creek to run at that particular moment. Laurel and Mill drain their water fastest because they have a smaller watershed than does Mann’s Creek. If you want to run those sections, you have to get there quickly. This is why these eager kayakers were at Captain Crunch Falls at 7:30 am on a Sunday morning. Had they waited until that afternoon, there might not have been enough water to run the falls and the Captain would have reared his ugly crunch. Great pictures and write up, love what you’ve created here Chad. Keep up the good work! Hi, Patrick! Thank you for the compliment! Thank you also for checking out the website and blog. It’s good to hear from you!